According to a new market report published by Transparency Market Research , the global digital content creation market was valued at US$ 9,336.8 Mn in 2016 and is projected to expand at a compound annual growth rate of 16.8% from 2018 to 2026, reaching US$ 43,237.7 Mn by the end of the forecast period. According to the report, North America was the largest contributor in terms of revenue to the digital content creation market in 2016. This is primarily due to strong technological advancement and considerable application of content creation tools in several end-users such as retail and government sector across the region. Continuous spending by enterprises of all sizes on digital marketing is the major factor which is expected to fuel the growth of the digital content creation market across the globe. Enterprises are spending huge amounts on advertising for the creation of relevant and customer engaging content. This in turn is boosting the digital content creation sector across the world. Furthermore, individuals are spending a considerable amount of time on social media. Moreover, they are continuously sharing digital content in the form of memes, GIFs, images, and videos. This content has now become a means of communication. Apart from this, the growth of the digital content creation market is mainly driven by the growing demand for brand promotions and advertisement. The content analytics feature in content creation and publishing tools could provide a comprehensive solution to enterprises and freelancers. Thus, integration of the content analytics feature with content creation tools is providing huge opportunity to vendors to develop more advanced digital content creation tools. Increasing emphasis of enterprises in different industries to spend on content marketing is expected to drive the market growth during the forecast period. The global market for digital content creation is segmented on the basis of component, content format, deployment type, enterprise size, end-use industry, and geographic regions. Based on component, the market is segmented into tools and services. The tools segment is further split into content authoring, content transformation, and content publishing. The services segment has been categorized into professional services and managed services. In 2017, the tools segment accounted for the largest market share in terms of revenue of the global digital content creation market. Based on content format, the market is segmented into textual, graphical, video, and audio. On the basis of deployment, the market is segmented into cloud and on premise. Shifting trend toward cloud-based solutions is expected to accelerate the demand for cloud-based digital content creation around the globe. The technology is gaining popularity due to its flexibility, scalability, cost-effectiveness, and massive processing power. In terms of enterprise size, the market is segmented into small & medium enterprises, and large enterprises. Based on end-use industry, the global digital content creation market is segmented into retail & e-commerce, government, automotive, healthcare & pharmaceutical, media and entertainment, education, travel & tourism and others. Based on geography, the global digital content creation market is segregated into North America, Asia Pacific, Europe, South America, and Middle East & Africa. Among these regions, the market for digital content creation in North America is expected to hold a dominant position throughout the forecast period. However, Asia Pacific and Europe are expected to contribute significant market share during the forecast period. 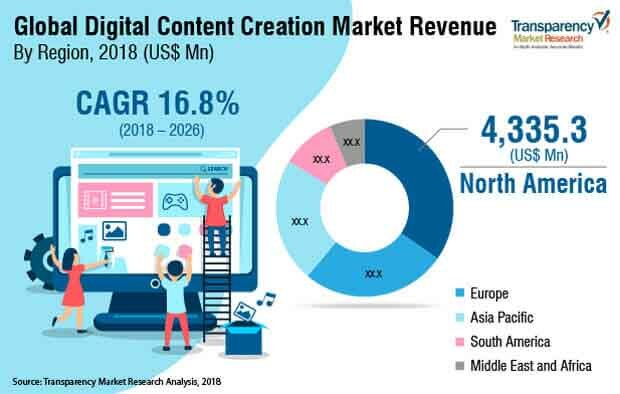 Furthermore, the Asia Pacific digital content creation market is anticipated to expand at a significant growth rate during the forecast period. Digital content creation solution providers are expanding their product portfolio through integration of different services and software upgrade, which provides them a larger customer base with enhanced and advanced tools. The global digital content creation market includes different players such as Acrolinx GmbH, Adobe Systems Incorporated, Aptara Inc., Apple, Inc., Corel Corporation, Integra Software Services Pvt. Ltd., MarketMuse, Inc., Microsoft Corporation, Quark Software, Inc. and Trivantis.